If you have been following my journey, you know that I swear by my little color coded portion containers for meal planing! These containers help keep me on track, make meal planning super easy, and not only helped me lose the postpartum baby weight but makes meal planning a breeze! That is why I am so excited to announce my newest program, The Ultimate Portion Fix, which actually dives deeper into the container system and now includes a KIDS MEAL GUIDE! It will be released on March 18th! After a year of helping customers reach their health and fitness goals, I have completed the official test group for the Ultimate Portion Fix and credit it for my healthy mindset! Want more details on the program? Check out the video below! This is not a diet, this is a lifestyle change, nutrition plan, and learning experience designed for EVERYONE (including husbands and kids). The plan will teach you how to eat better, not just tell you. By the end, you’ll have a whole new way of thinking about food! Plus, it’s a simple and sustainable plan that will keep you wanting to eat healthy in the long-term. It’s designed for the entire family: There’s a big emphasis on kids and how to get them to eat healthy, not just you! Yes, even with a good eater like Sam I get the “I want chicken nuggets” argument, and I’ve got strategies to win! Along with the in depth meal plan you now have the opportunity to workout Live with Autumn Calabrese, the creator of the 21 Day Fix and 21 Day Fix Extreme when she does a LIVE RESHOOT of both of these programs! This was exactly how the 80 Day Obsession Test Group worked and let me tell you, it was AWESOME. There’s just something about knowing that the whole cast is in it with you at the same time — no pushing pause — that makes you work harder! 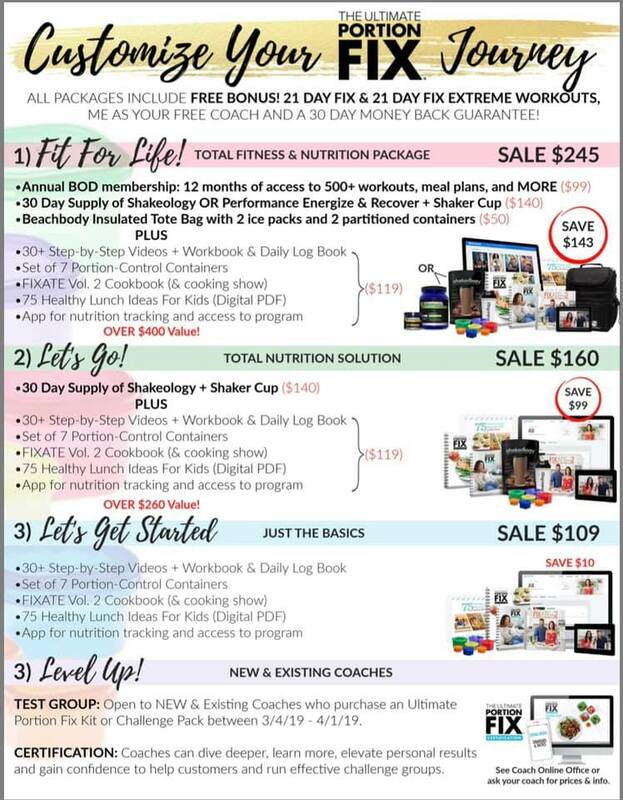 All you have to do is purchase the Ultimate Portion Fix when it launches in March 18th and you’ll get an invitation to join the live workouts starting in April! We have different options depending on whether you are a NEW customer or a CURRENT customer! Read on! READY TO GO ALL IN WITH YOUR NUTRITION? I am so excited to help you get started with the program that changed my life. Please complete the form below and I will get you all the details on how to order as soon as the program releases! Checkbox 1Which Ultimate Portion Fix (UPF) package are you interested in?